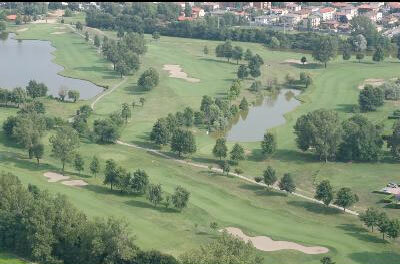 Italy Tee Time is a concierge service for booking your green fees. Reservation will be confirmed within 72hrs; we cannot guarantee reservation for tee time booked in a less period of time. Take also note that our office is closed on Saturday and Sunday. In case the course will be closed for bad weather condition the green fee will be refunded in total. Golf Cub Ambrosiano was designed by Brian Silva and was openned in 1994. The main feature of the golf course is that 14 holes have water hazzards. The course is very flat making it very easy to walk but there is always golf cars available. Ambrosiano is considered one of the better designed golf courses in the Milano area and all visitors find it very intresting and a good test of golf because of its florida pencross Greens and Fairways. Sure, this recent course is close to Milano, but it is also not far from Pavia, at whose university Petrarch and Leonardo da Vinci studied in the days gone by. This was also one of the strongholds of the Visconti who built their mausoleum to the north of the city at Certosa di PAvia (Charterhouse of Pavia), an extraordinary Lombardy-style church somewhere between the Gothic and Renaissance styles. It is also just a few miles from Ambrosiano. Golfers who have no time for history or old buildings can play this course twice in a day. Being virtually shorn of trees, it is hard to immediately appreciate game strategy and visualize the traps. The clever layout of the very many hazards makes this a very amusing and high quality course, even though the landscape is nothing to write home about. It is, however, a much trickier proposition when played from the back tees. The region has countless other distinctive facets. Lombardy, aided by its geographic position and fertile soil, will captivate you - nature, history, art and culture marry in harmony with innovation, technology, fashion, entertainment, and a contemporary outlook. The region comprises the provinces of Bergamo, Brescia, Como, Cremona, Lecco, Lodi, Mantua, Milan (regional capital), Monza and Brianza, Pavia, Sondrio and Varese. Large, lively and industrious, the Province of Milan is the second most populous in Italy. Its territory extends over a stretch of the Po Valley and includes the River Ticino to the west, and the River Adda to the east. It is shaped by its waterways: river and canals that traverse it and sometimes border it, from the Lambro and Olana Rivers to the numerous canals, the Navigli Milanesi, ancient links between the area's major water runs. These runs link farmsteads and villages like that of Corneliano Bertario with the Castello Borromeo Castle; and ancient noble villas, such as the Inzago Villa near the Naviglio Martesana, to the Canale Villoresi, thought to be the longest man-made canal in Italy. The Villoresi marks the natural southern border of Brianza, an area in Lombardy noted for its mountains, lakes and plains. The territory of Milan contains six regional natural parks: Parco Adda Nord, Parco Agricolo Sud Milano, Parco delle Groane, Parco Nord Milano, Parco della Valle del Lambro and the Parco Lombardo della Valle del Ticino. Half the Province of Milan is agricultural and flood plain, and most of it is protected by reserves. Each of these habitats features a variety of natural, country and architectural landscapes of great interest.